How much cost the repair of windows? Every responsible property owner is interested in maintaining her good technical condition. For example, if something happens to the floor, this problem will not be critical, and in most cases it can be postponed. Windows are quite vulnerable places of any object, so if you experience any trouble you need to take appropriate measures. Practice shows that good windows can last for decades, but it is unacceptable to abandon their routine maintenance. In most cases, you can replace worn parts with new analogues and thereby restore your windows. What determines the cost of repair? The window is a fairly simple design, so damage is extremely rare. In fact, they have a fairly large load, so from time to time we have to deal with the repair and maintenance of this building element. High-quality windows are developed taking into account the loads that they will have to face in the future, which allows them to increase their service life. The most expensive repair is the complete replacement of window units in the entire building, but the need for it is rare. Often the windows can be repaired with minimal cost by contacting a specialized company. The cost of repairing windows depends largely on their initial value and quantity within one building. What depends on the type of window? That type of window will determine the cost of its repair. Constructions can be wooden or plastic, include one or several glass packs, differ in accessories and design features. For example, if you just need to replace a simple glass unit in a plastic window, then such repairs will be inexpensive, as well as replacing accessories. If we are talking about replacing or repairing a wooden box of a window block, then there will already be higher costs. Each time the cost of repair is determined individually, after the object has been studied by a specialist from a profile company. All windows differ structurally and workmanship, but the method of their repair is almost always the same. It is wooden windows that often require repairs, especially if we are talking about low-end products that are not famous for their high quality. 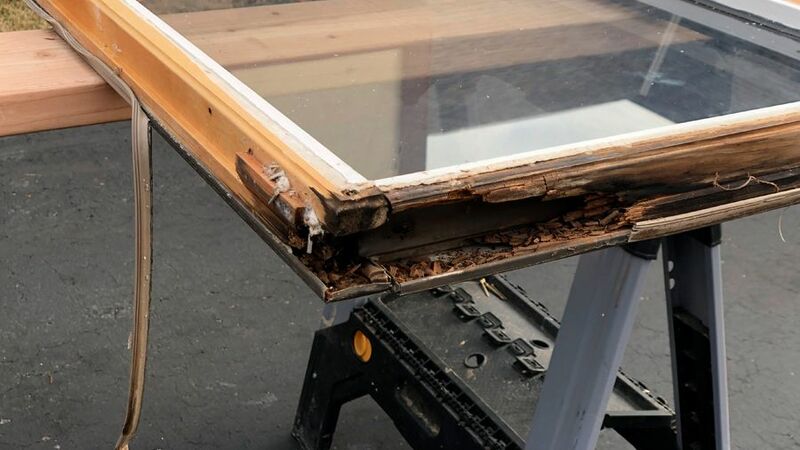 Provided that the wood has not been treated with special impregnations, it can simply start to rot, and because of this, the window will simply become unusable. It can be repaired or replaced, and the second option will require significant investments. Parts that have been damaged by rotting can simply be replaced with new ones, but already treated with protective agents from fungi. Also, wooden windows can suffer from malicious insects, which will simply eat up the window block. In this case, the damaged parts will have to be changed, since it is no longer possible to restore them. Today, special formulations are available that allow you to quickly get rid of insect pests, since they simply will not have interest in wood soaked with toxic products. You can try to repair the windows yourself, using a putty and other mixtures, but in this case there will be no guarantee that the construction will last for a long time and will not spontaneously fail. It is advisable to immediately contact a specialized company that can provide assistance in a short time and at an affordable cost. This is the only option to ensure the durability of wooden windows and not to face in the near future with their replacement. If any large parts of the window are damaged, it will not be possible to do without replacing them. In any case, it is advisable to immediately contact the professionals and not waste time on trying to rectify the situation on their own. Often windows need repair if the glazing has been damaged. In due course double-glazed windows even from eminent manufacturers grow turbid and lose the popularity. You can not worry about this, as the glazing can be quickly replaced. The same problem can occur if the horse has damage due to mechanical impact on them. Broken glass also changes in a short time by experienced professionals. If you intend to quickly and cheaply restore windows in any property, it is enough just to call a specialized company and order a master's departure so that he can estimate the scope of work and call the approximate cost of work. Glasses can be replaced on your own, and on the Internet there are many recommendations regarding this topic. Practice shows that doing this kind of work is far from always rational, especially if you have never come across it before. Many companies offer cheap services, so there is no reason to refuse to use them. Each year, specialized organizations become more, so you can always put your windows in order in a short time. Lack of experience and proper equipment will negatively affect the process of self-repairing windows, so you should think carefully before taking on such work. Windows is an important component of any property. If for some reason they suddenly fail, then this does not mean that they will have to be replaced completely. You can contact a specialized window repair company. In a short time the employee will arrive at the site, determine the scope of work and the level of costs, so you will have a clear idea of ​​which windows can be repaired and which will have to be replaced, as well as receive information about the rates for the services of specialists.